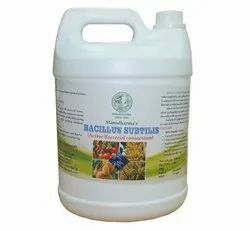 Leading Manufacturer of decomposing culture and bacillus subtilis from Chennai. Organic matter is vital for maintaining soil fertility as it provides different plant nutrients and suitable environment for microbial population and improves physio-chemical properties of soil. But in its natural structure, without being decomposed the organic matter contributes little to the improvement of soils and in crop production. The plant nutrients in these materials become available only through decomposition. Generally, under normal environment, it takes 3-8 months to get it decomposed while with addition of certain microorganisms (viz, Bacillus sp. , Pseudomonas sp. , Trichoderma spp., Phaenerochaete sp. , Cellulomonas sp., etc. , ) the time of decomposition can be shortened to 4-6 weeks. Biodegrader is enriched with mixer of microbes that activate and rapidly multiply in the manure composting pit within 24 h after the application. As these microorganisms go to work to degrade the waste, the digestive process in the compost pit changes from anaerobic to aerobic, which quickly reduces offensive odors and destroys pathogenic organisms. The synergistic action of bio-augmentation and enzymatic catalysis breaks down even the toughest of animal and plant wastes into healthy, enriched, nutrient-balanced compost. Biodegrader produces large amounts of self-generating dissolved and free oxygen, which accomplishes aeration without turning the compost pit either manually or mechanically, thus saving both labour and energy. The most effective application method is to dilute 1 liter (to decompose one metric ton of waste) of biodegrader with 100 litres of 1% cow dung solution (or) 1% sugar solution and spray layer by layer on the waste. Alternatively, a number of vertical holes can be made in the manure pit and diluted biodegrader poured in it. Compost heaps should be covered with straw or plant-wastes to retain 40-50% moisture (ambient temperature for decomposition). 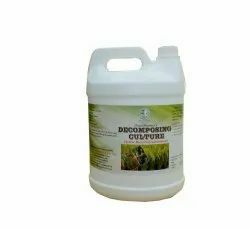 The most effective application method is to dilute 1 kg (to decompose one metric ton of waste) of biodegrader with 100 litres of 1% cow dung solution (or) 1% sugar solution and spray layer by layer on the waste. Alternatively, a number of vertical holes can be made in the manure pit and diluted biodegrader poured in it. Compost heaps should be covered with straw or plant-wastes to retain 40-50% moisture (ambient temperature for decomposition). Looking for Decomposers Powder & Liquid ?